I wish I had considered this several years ago but it came to me again that I should be recording those 72 Customs that show up from time to time in order to track available quantities. Having info if with Build Sheet, Vin Numbers if available would be beneficial. Doesn't matter if fully customized or all the way to stock. Finding out as close as possible how many are still in existence is my goal. Those within the Club who own Customs, please share your info as the Base for this quest. Any and all suggestions appreciated. I will attempt to categorize them in groups that match closest to each other. Example - With Build Sheets would be one category, along with engine size ect. ect. Let me know what kind of support I can expect in order to establish how many still in existence. I am Dog watching this week and in and out but will be back to normal around here come Sunday. No other commitments until April 4 thru the 8th for the Portland PIR Swap Meet at the race track. Anyone attending are welcome to stop in and visit. We will be set up on the West end of the (can't spell it) turn out on main straight away. I will provide space numbers when I get that info. Aftyer that I'm good til near the end of April for a day or two. Just letting you know this so not to think I am being unresponsive, just busy at the moment. I am serious about wanting to establish some numbers to better reflect their rarity. Thanx for the support and looking forward to your questions and advise. I'm in. Mine is a '72 "W"code I think its a great idea, however not sure how many will chime in. Thanx Willie. I don't expect to be able to track them all but come up with a informed representation. Having enough info so as not to duplicate any finds is optimal. Considering our reach as a Car Enthusiast Web Site, I believe with help, we can come up with current numbers that closely represents those cars. I know of (2), one that was sold here in Oregon and another that periodically shows up on Craigslist. I will check those Ad's placed in our Forum and see what I can glean from them for Custom ad's. You don't have to be there to verify, any info seen, read or heard that can be verified. I will attempt to break down the data supplied. Once most/all had seen this, I think this could be a very useful Project for the Club. Farmall (Kieth Goad) just sold his, He may have some info that he could add. Hi I will be taking apart a 72 Custom unfortunately .Car has major rust issued ,it is a small block Custom. Let me know if you would still like the info on the car for your data base. If parted out, the information is mute. Only those vehicles that are still considered restorable even if not running are eligible..
'72 Custom 350/350, 12 bolt posi. With build sheet, original engine, trans and rear (I did change the gears though) and lots of options, see my signature. Wish it was a big block, but oh well. What else do you want to know? Cory M (CKZ03) a FGMCC Member from Ohio I believe, has an outstanding example of a Custom. Haven't seen him on line for quite a while, but he was quite active a few years ago. Hope someone will encourage him to pipe up. I also have a custom in pewter silver. 350 car with th350 as well. Numbers matching and 66k original miles.car was built in Van Nuys California in November of 71 and stayed in California until 1988. I'm the third owner. It also has factory cruise control which still works! I have a Custom also. Thank you Mike. Will see how all that info will work on a Excel Spreadsheet. This is the type of info that will help ensuring no duplication's. When I have enough info and a good representation of the Excel Spreadsheet, I will see how/if/can post it for your review, ideas and or suggestions. Hey Doug I will try and get my buildsheet out and list everything this week. I will attempt to get an update from him & thanx. Appreciate that Willie. I am currently constructing a Excel Spreadsheet that hopefully I can get as much info into as possible/practical. When I am comfortable all the pertinent info is included, I will make a photo on the Scanner and Post it for you guys to inspect & then can inform me of omissions or erroneous info for those who see misinformation on their/others Cars.. A bit of a challenge trying to get enough space for all that info so had to change font size & use abbreviations for some of the features. I have noted at the end of those what the abbreviations stand for and not close to being the final Draft so bear with me. Again a work in progress! Any ideas, criticisms or otherwise always appreciated. I am relying on the Club membership to help by identifying any Customs found anywhere and as much info as can be provided. Our Membership has a International Reach as well as Nationally, so it is my belief we as a Club can come up with a educated number based on the info given. Of course, it will be never ending until we can say absolutely no more Customs survived!! You can use my email (camerondl@q.com) as well as the Private Message along with this Post as a way to communicate. For those with Customs, I am leaving it up to each one in providing what info they want Posted based on the format provided, otherwise it will not show in Spreadsheet and ONLY I at this time will make any and ALL changes based on documented communication and your expertise in determining if a valid Addition. If unsure, I will take the reins and attempt to contact (if possible) the owner & see what they can contribute. I have a rough draft for your review. So much info I improvised getting it all on one page. Acronyms are at bottom of pic in case you have trouble deciphering them. Fonts are small so you may need to zoom in to see or print it out. It is somewhat unorthodox, again due to the amount of info I included. Let me know what you think and please, if any ideas, do offer them up. Also, I am thinking that starting a new thread where just that info found could be posted and only for those finds. It will make it much easier for me to follow than having a lot of commentary with those cars identified. As long as it came from the factory as a Custom (Z03) equipped, modifications are not important as long as verifiable. If there are any questions, refer them to me so we can work through those problems. For now, simply look over the spreadsheet, determine how it is laid out to make it easier to follow. Any questions, please do. While I am mostly in and out during the day, there is a Swap Meet coming up next Wednesday thru Sunday I will be attending as we have a Booth there for all day each day and will not have much if any time during that period to respond to questions. Don't get disheartened, I will get back to you when I have the time. Once Swap Meet is over, I will be more back to normal again until the Car Shows start lining up. I know where three of them are not. Two Dubyas and one U code. All rusted beyond repair. I appreciate the work your doing on the spreadsheets. Sorry I was general on my description. But if your interested in adding it has black bucket seats with comfort tilt option with NK4??? Sterring wheel which is 4 spoke. From what I understand if your custom has comfort tilt it comes with that wheel. 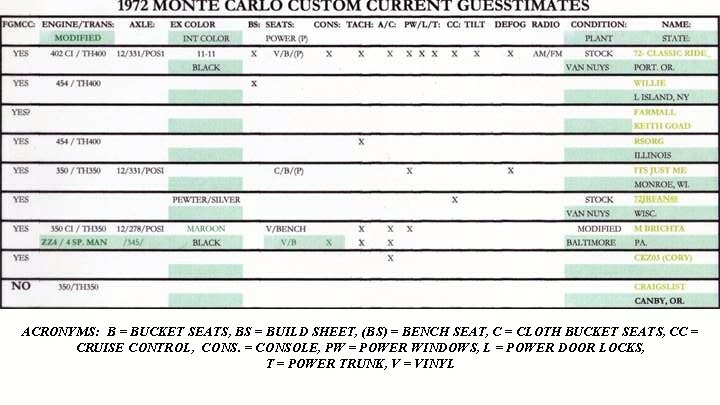 Most other customs come with the common custom wheel with cursive monte carlo script. Maybe others can chime in on this?? ?Mine is also a non AC car with Am/Fm radio. Power trunk release and cruise control. Thanks again for compiling this information Doug! No problem Eric. I have updated your new info. What size motor & transmission (if you would like that added). You are correct that with comfort tilt steering you also get the 4 spoke sport wheel. I have a Custom, original paint with ZP2 trim/color override - Golden Brown, Covert Vinyl Top, L48, buckets, U14 gauges, A/C, tilt wheel, V01 HD Radiator, UM2 AM/FM w/tape, ZJ9 Lighting Group, pretty loaded, NK4 sport steering wheel. I can send a build sheet if needed.